By the time this editorial is published, the deal between Gov. Arnold Schwarzenegger and five Indian tribes that will allow an unlimited number of slot machines at their casinos in exchange for an estimated 15 percent of their profits will be completed. Surely he believes that he is making the best of a bad situation. But it will hasten the day when Californians will regret that they didn't fight the expansion of gambling from day one. The problem has been that the status of tribes as independent entities, generally exempt from state and local laws, has prevented state and local government control over what tribes can do on their own land. When tribes were permitted to expand from small bingo-focused operations to full Nevada-style resort casinos, the floodgate was opened for out-of-state gambling interests to take over and use tribes as shills so they could rapidly expand. Not content with the current pace, pressure is on to allow even more casinos and more gambling to come in. There are two propositions on the November ballot. One to allow expansion of Nevada-style gambling to off-reservation entities like card rooms and racetracks, and another that seeks special status for one Southern California tribe under the guise of applying corporate taxes to casinos. If we had our druthers, we would say no to both propositions and the governor's deal, and institute a full-court press to block the addition of any kind of casinos, or additional expansion of existing casinos, whether they are run by tribes or by other business interests. But the governor's not going to care what the editor of the Index-Tribune thinks. He's trying to get money from the tribes to solve the state's current budget crisis, and if that means allowing the expansion of gambling, it is the price he is willing to have us pay. In this case, Arnold is making a huge mistake. 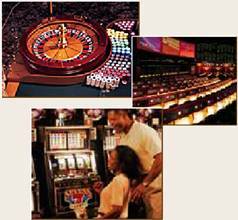 Gambling enterprises, whether controlled by tribes or by other entities, are bad for communities in which they exist. Whatever they generate in jobs and other revenue for local use is entirely offset by the costs to local government and financial harm to people who can least afford it. Gambling doesn't produce anything. It drains money that would otherwise be spent in local businesses on food, clothing, shelter and other products and services. Most of the profits leave the area immediately. Californians would be better off taxing themselves to pay off whatever perceived debt there remains to the descendents of allegedly abused Native American tribes than allow gambling to grow in this state. Lynch's criticism of gambling is unsubstantiated. He's already charged tribes with being "shills," implying they have no intelligence or independence. The stereotype here is calling tribes "allegedly abused," as if California's history of genocide and oppression are only political inventions.